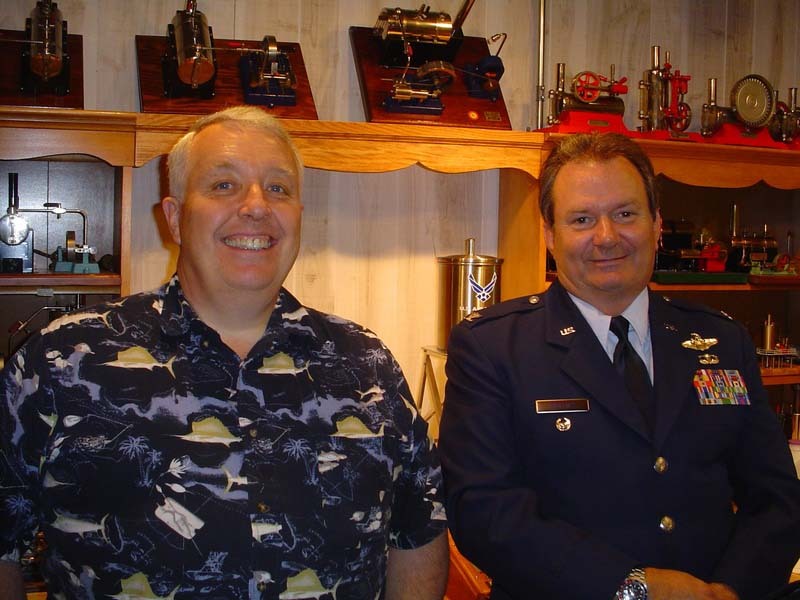 On June 27, 2009 I had the distinct pleasure of welcoming Air Force Col. Mike Phillips (below) to the Temple of Steam. I love having visitors, but Mike wasn't a visitor alone, he is the new owner of the Jensen 51R002 engine we are standing in front of below (you can just see the water tank with AF logo over our shoulders). We spent many an hour running and going over the operational details of his new 75 pound baby which will follow him 2,000 miles home when I ship it out later this week. It would have been nice to send it home with him, but it doesn't lend itself to carry on baggage! Mike, it was my pleasure to build 51R002 for you and I hope it gives you many enjoyable hours...the look on your face convinced me you are the right guy to give this engine a good home for years to come.